My First Olympic Triathlon – Iron Mountain Triathlon – Race Report | Tina is Fit! 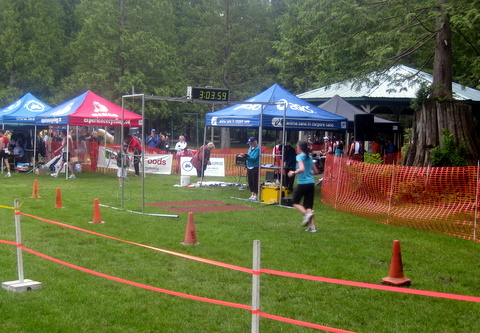 On Sunday, I completed my first over Olympic distance triathlon (Iron Mountain Triathlon). Overall, I am happy with how I did although I didn’t exactly set the bar high for me to improve in my upcoming Olympic-distance races. In the morning, I was out of bed by 4:15am and on my bike on the trainer for almost 20 minutes. Then a bowl of instant oatmeal, and we were out the door for the 45-minute drive to Maple Ridge. Strangely, I didn’t feel nervous in the morning, although I had been nervous to the point of nausea the day before. After arriving, I got body marked, set up my transition area, and taped a couple of Guus to my bike. I had meant to do a 10-minute warm-up run, but the time slid away very quickly, and before I knew it I only had 10 minutes to get into my wetsuit and down to the water’s edge before race start. I managed to do a few strokes out and back and then – bang – the race started. I am so glad that swim is over. It was my first ever open water swim – until now, I have only ever trained in a pool – and my first ever Olympic distance swim in a race situation. And after much discussion with several other athletes, including several of the elite racers, there seemed to be some consensus that the course was long, probably closer to 1.9km, not the intended 1.5km. So overall, I probably swam almost 2km (I’m new so I invariably swam extra correcting my swim direction) in cold scary waters. I spent most of my summers on Okanagan Lake, yet I have always been terrified of swimming any distance in open water. Weeds! Dark depths! Carnivorous, human-eating fish! 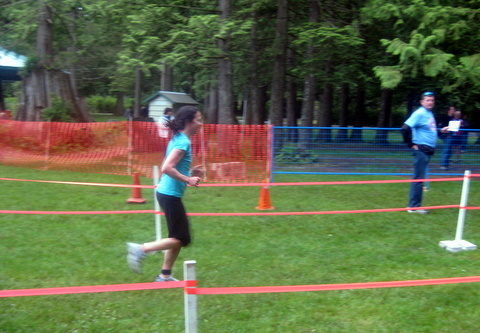 Doing this race was the most harsh, yet successful (and some would say stupid), way of overcoming this fear. 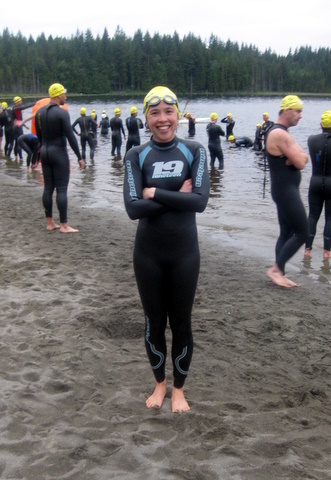 I went swimming in a race situation, in my first ever Olympic distance triathlon, in a much-murkier-than-Okanagan-Lake lake, where I couldn’t see further than two feet in front of me, among patches of weeds that touched the surface of the lake. Plus it was my first time ever swimming in a wetsuit. I am happy to report that I did not panic when I saw the weeds, nor when they brushed at my hands and feet in their menacing way. I was also not consumed by the aforementioned fish. Although my lack of panic was a positive thing, I still think the only way to describe the swim is that it sucked. We had to do two loops of the course and when I rounded the buoy to start out for my second loop, I couldn’t believe that I had to do that swim over again. I felt dizzy through most of it because I am extremely susceptible to motion sickness and wetsuits make you bob and float like a cork. Halfway through the second loop I actually stopped for a second and considered throwing up. A few burps later, the sensation passed, and I was able to continue on. Thankfully there were only 77 athletes in the race, so there wasn’t a lot of banging into other swimmers, and I tried to stay to the edge at the start so I could avoid the proverbial “washing machine” of athletes. When I finally finished – 39 whopping minutes after the race start – I staggered into transition. I felt so dizzy and dazed that I almost toppled over but was able to regain my balance on one of the transition racks. I reminded myself that my goal for the race was to finish before the cutoffs and survive the open water swim so I took my time in transition. After the race was over, my husband said he wanted to yell at me, “You know this is a race, right? !” because of how slowly I was moving. Lucky for him he kept his mouth shut. I ended up taking 3:14 in transition which may be slow for some, but I was pleased that it took me so little time to strip out of my wetsuit, pop on my clothes, re-pin two safety pins that popped off my race number in the process of getting dressed, and regain my equilibrium. The bike portion was fun. 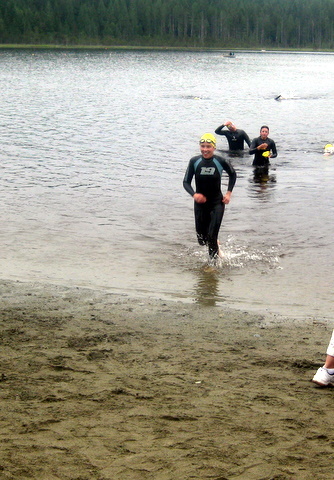 I felt good within a minute or two of leaving transition, probably due to sheer relief at having finished the swim. The first part was mostly a huge downhill, then it flattened out, and then there was a big climb back to transition. I passed a few people and got passed by a few others. Again, my biking seems to be weaker than I have always thought. I think it’s because I’m pretty good as a long steady rider, and I’m certainly stronger than the average joe bike commuter with whom I usually compare myself, but I’m not very fast against most “real” riders and triathletes here in BC. On the other hand, in retrospect I am pretty sure I could have pushed harder in the bike portion of this race. I kept thinking I needed to conserve energy for the big climb in the second half, but I was probably too conservative. When I hit the hills, they went more quickly than I expected and they weren’t as tough as I thought they would be when I drove the course the day before. I think working out my “race pace” on the bike is something I will need to work on in the future. Total time on the 40km bike portion: 1:28:47. The transition to the run was not too bad. Rack bike, remove bike shoes and helmet, put on running shoes. Oh, and blow nose with the hanky I left on my shoes because I knew my nose would be a faucet after the bike (it always is). I grabbed my GPS watch so I could keep track of my pace, but stupidly had not reset it, so I had to fiddle with it a bit on my run out. Transition time was 1:17. The course was an out and back twice with a couple of tiny but wicked hills thrown in for good measure. I thought I generally did a pretty good job of maintaining my goal 5:00/km pace, but my final time was 51:41. As with the bike portion, I probably could have pushed harder on the run. I actually enjoyed the run because it was the one leg where I got to see the faces of the other athletes. It was nice to smile and be smiled at. I think one of the most enjoyable parts of racing is the support and encouragement all the athletes have for one another (especially at the recreational level). I was happy to finish the race and get an Olympic distance under my belt. Total time to finish was 3:04:01. Although I was aiming to finish in under 3 hours, I am still happy with my time. My goals were to survive the open water swim (check! ), make all the cutoffs (check! ), and have fun (check! ), so I feel like I succeeded. I can only improve from here, right? Next up: the Penticton Peach Classic on July 18, only four weeks away. Well done on your first Tri – awesome! one question, how do I know if Im ready for an olympid distance tri? I swam a half a mile, biked 35km and ran for 5k a couple weeks ago… does this make me alright for a real tri? I’m no expert, but I guess I would say that it depends on how you felt when you did that? I think it makes you ready at least for a sprint distance tri. But, again, it depends on how hard that was for you and how fast you want to be when you race an Olympic distance.